There were a record number of women elected to Congress last year, marking a huge shift in women’s influence in politics and public service. NAWBO hopes to support that shift this June through our annual National Advocacy Day and Academy for Public Service to help members explore and pursue their own paths into public service. Held June 3 in Washington, D.C. prior to National Advocacy Day, the Academy for Public Service gives NAWBO members access to information and experts in all arenas of public service––from politics to board service. While many may assume “public service” means running for Congress, Joy Lutes, NAWBO National VP of External Affairs, notes there are many opportunities the Academy can help women with. “We need more women in all public service arenas. Not everyone could or should run for federal office. What happens in Washington, D.C. receives a lot of deserved attention but a lot of governing also happens at the state and municipal levels,” she says. “The Academy is designed to showcase all the avenues into public service and highlight our members who are doing well in those spaces.” This includes running for office; managing or working on a campaign for office; volunteer opportunities on campaigns that allow members to utilize their business skills like legal or accounting; and board service. The Academy is also an opportunity to highlight chapter leaders who are doing amazing advocacy work from within their chapters. 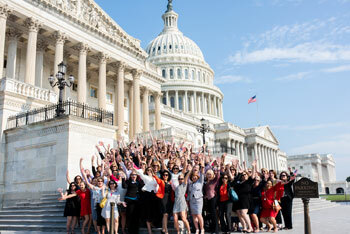 NAWBO National’s Advocacy Day is another great resource for women to connect with peers, politicians and public policy experts in the nation’s capital. Joy points out that this summer event is more important for women business owners now more than ever. “There is always a need for good people in all areas of public service. That’s what makes the government run and what makes this country great. I think of political preferences as swinging back-and-forth on a pendulum and within that system there is always a need for balance in the middle. Because of the rich diversity in our membership, that is something we can provide to the conversations and are happy to do so. We cannot cede the advocacy arena to people who just want to use it to obstruct or advocate for their own selfish agenda,” she says. Want to learn more in the meantime? Tune into our webinar on May 21 at 12 noon to 1 p.m. ET to hear more about the plans for the day and as well as from members who have attended past events.